I am on the toilet, my black dress pants scrunched down around my ankles. I am not using the bathroom, but I want to keep up appearances. Or maybe de-pantsing is a reflex in bathroom stalls. I got up in the middle of improv class to check a missed call and voicemail from an unknown number on my phone. Many times in this stall I had repeated those words to myself, penance for plodding onto stage with cement feet and pandering for the approval of my classmates. The stall served as my place to recover from wounds on and off the stage. Someone had sharpied this phrase on the stall door, right at my eye level. The stalls in the girls bathroom were covered with pen and sharpie graffiti, but those words always grabbed my attention first, usually with prophetic timing. The stall sat in the far corner of the Del Close Theatre in the old iO building, the place I fell in love with and learned longform improvisational comedy. I started taking classes in 2010, somewhere in the depressive stupor of a difficult breakup. The place felt like a speakeasy for quirky folks–dingy, dark, and cramped. It did not provide a home for shiny-polished things, but a fertile ground for magic. The iO building was located at 3541 North Clark, kitty-corner from Wrigley Field. It was not the ideal place for a theater. To get there, I nudged my way through Chicago Cubs foot traffic and mobs of bros who reminded me of my ex-boyfriend. I’d snake between cooing street vendors offering tickets from their back pockets and water bottles from blue coolers. When I arrived at the theatre, purified by the incense clouds of cigarette smoke, I got swallowed into the crowd gathered in the lobby. I always think of people piling into that building; the walls pushed in on us and narrowed the margins between our bodies, teaching us to come together in the way tall ceilinged cathedrals invite visitors to crane their necks to the heavens. The building nudged us to huddle in, to listen to stories, and to perform in a way that made the audience lean forward and nod in recognition. Before my graduation shows, our instructor counseled my class to walk on stage during the blackout so the lights went on as we entered, catching the momentum of our team moving forward onto the stage and into the light. It was fitting advice for living too, after all, comedians are notoriously familiar with darkness of all kinds. We all tried so desperately to walk together into the light spaces, but the building held the darkness too, brightly painted blue walls and dark corners with ghost stories of depression and overdoses. There were nights when the building shook with laughter and others when it groaned from the weight of the heavy things we carried in our pockets. My graduating class only got to perform three or four times at the theatre on Clark before the whole operation moved to Kingsbury street in the Lincoln Park neighborhood. The new theatre building has potential, but it’s sterile and easier to get lost in with no cave paintings on the bathroom stalls. I tried to alter my daydreams of playing on the stages of the old theatre, relocating them a couple miles south, but my mind’s eye is slow to catch on. As they say, you can’t go back. Right now, the old iO theatre sits as an empty relic on Clark street, waiting to be knocked down and made into a CVS, which isn’t even as good as a Walgreens. Our theatre will be disposed of much like the shows we performed on its stages and in its classrooms, carefully constructed, lived in, worn out, and then demolished– a flash in the pan, utterly forgettable. And yet, there were those nights–those glorious nights–that we carried the show out as a glowing gift only visible to those who gathered that night to listen to stories. Playing improv at the old iO theatre felt like performing near the earth’s core while the patron saints framed on the wall watched on. When I think of a fitting end to that beloved blue building, I think of us pushing it out to sea, towards some heaven-like land, something Lord of the Rings-like, Gandalf being set loose towards an elvin heaven. I wish to baptize every nook and cranny as sacred ground, to annotate hallways and stairwells with my memories. But maybe the best I can do is to take all that the building taught me, and bring its lessons into new spaces, whose walls don’t yet whisper. 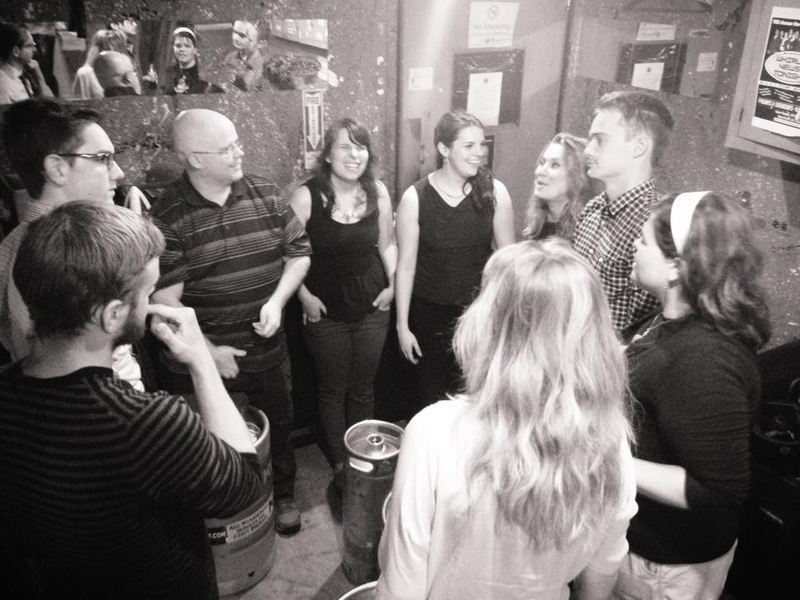 “The Writing on the Stall” was written by Meredith Bazzoli (center with tank top, hands in pockets). Meredith has spent her whole life orbiting around Chicago and its suburbs. She currently resides just west of the city with her husband Drew, who grew up a hoosier. She never thought she could marry one of those. Meredith writes, performs improv comedy, and teaches in West Garfield Park (all stories for another day). She seeks to start conversations about the life we stuff under the bed and keep off our Instagram feeds. This entry was posted in Guest, Memory & Place and tagged change, Chicago, improv, improv comedy, iO theater, iO theatre, theater, theatre. Bookmark the permalink. Oh man, Meredith, you are my people – and now improv too. I love it. One of these days we’re going for coffee and drinking life together for awhile. Love this tribute to your own unexpectedly sacred place. I’m already planning a coffee date next time I visit my dear friend in Colorado Springs!